From left: Spencer Chase of Agri-Pulse (moderator), Michael Turley of Rolling Lawns Farm, Greenville, Ill.; Luke Howard of Homestead Farms Inc., Millington, Md. ; Shelby Watson-Hampton of Robin Hill Farm and Vineyards, Brandywine, Md. ; Kyle Tom of Tom Farms, Leesburg, Ind. ; and John Shepherd, Shepherd Grain Farm, Blackstone, Va., discuss the issues of beginning farmers. A group of beginning farmers on Monday gave a Washington summit on farming in the year 2040 a taste of what it takes to be an up-and-coming farmer and explained how vital various farm programs had been in the development of their businesses. Michael Turley, owner of Rolling Lawns Farm, a century-old family dairy operation in Greenville, Ill., told the summit sponsored by Agri-Pulse that he decided to "leave the supply chain and become part of the value chain" a few years ago. He stopped selling milk to dairy co-ops and became a supplier of milk to high-end restaurants and coffee shops in St. Louis, Mo., the nearest large city. On a normal Monday afternoon, Turley said, he would be in the fancy restaurants in St. Louis promoting his products to chefs. Turley said he has introduced the chefs and consumers who visit the farm to his Holstein milk cows and treats the animals accordingly. One cow, Iris, has gotten old and no longer produces milk, but Turley has not sent her off to a hamburger plant. "The first cow I introduced to the chefs was Iris," Turley said. "She was a professional dairy cow." "When people come to our farm there is a reverence for the animal," Turley said. Consumers who visit the farm "know how they take care of a family dog, and they expect us to do the same." But to convert his family's century-old farm, he said he benefited from the Farm Service Agency Guaranteed Farm Loan Program to build his processing plant, the Farm Storage Loan Program to build storage facilities and the Value-Added Producer Grant program "to get the brand off the ground." John Shepherd of Blackstone, Va., who grew up on a two- or three-acre tobacco farm, said he realized as a high school student that he needed to go to Virginia Tech if he wanted to farm, and then started out by farming land that had been "abused" by tobacco. Shepherd said the Farm Service Agency Guaranteed Farm Loan Program was also vital to his operation, but that he first had to qualify by bringing in receipts from sales at farmers markets to prove he really was a farmer. He added that environmental cost-share programs have been important to his operation. Shepherd now has a 2,600-acre grain farm, but is converting 200 acres to organic production. Luke Howard of Homestead Farms Inc., a certified organic farm in Millington, Md., said that when they first started out, he and his wife both had off-farm jobs and wanted to convert their 70 acres to organics. The Environmental Quality Incentives Program, he said, allowed them to plant the bulk of the acreage into a grass legume mix and then after three years "till it down" for an organic crop. "Transitioning land (to organics) is really expensive," he noted. Kyle Tom of Tom Farms in Leesburg, Ind., acknowledged that he had not benefited from any beginner farm programs because as an eighth-generation farmer and the son of Kip Tom, a big farmer who is now President Donald Trump's nominee for U.S. ambassador to the United Nations food agencies in Rome, he was "born into it." Tom said his family farms in seven counties and also has an operation in Argentina. Farmers today must be customer-oriented, Tom said. "You have to look somebody in the eye and say, 'I am growing this for you. I am not looking to make tons and tons of money.'" Tom said his farm had used the Environmental Quality Incentives Program years ago, participates in federal crop insurance and is converting from the Agriculture Risk Coverage program to the Price Loss Coverage program. Shepherd, Tom and Howard all said crop insurance has been vital. Howard said he always viewed crop insurance as a "drought insurance policy," but in 2018, when his farm experienced 70 inches of rain, "it was a lifesaver for us." Crop insurance, he said, "is a smart use of tax dollars." Shelby Watson-Hampton of Robin Hill Farm and Vineyards in Brandywine, Md., explained that she is a fourth-generation farmer, but the operation has changed over time. Watson-Hampton's family initially grew hogs and tobacco, but her grandfather developed a large tree and shrub nursery. When her grandfather died unexpectedly, she was a pre-veterinary college student, and Watson-Hampton and an aunt came up with a business plan for a vineyard and winery. They brought their husbands into the business, planted the vines and three years later opened the winery. Watson-Hampton said both she and her husband have off-farm jobs; she is director of the Southern Maryland Agricultural Development Commission. They work at the vineyard-winery nights and weekends. Watson-Hampton said she and her family "could not have gotten where we are" without the "free" research from the federal government and assistance from extension services at the University of Maryland. All the farmers said they face challenges in affording health insurance for their families and their workers. Shepherd said his biggest problem is finding workers. But all sounded enthusiastic and hopeful about the future. Asked by Spencer Chase, the moderator, if they face pressures to grow, Turley said, "In dairy, you are going to get really big or stay really small. There is a stratification going on." 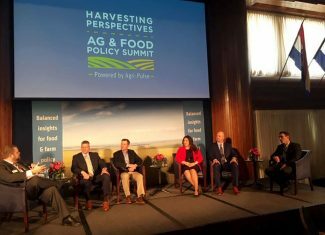 Turley said that the country needs both large farms that can fulfill the global demand for food and the small operations that can fulfill pressures from consumers "that want to know how we are doing things. The federal government is vital to helping us do both."